Medical doctors advise their patients to make a habit of having regular health checks. These routine examinations serve several purposes: they allow physicians to screen for common medical problems and diseases, assess the risk of future medical problems, and encourage a healthy lifestyle. When a patient is ill, having a relationship with a trusted physician or set of medical professionals is imperative. However, even for healthy patients, regular benchmarks ensure problems can be avoided or quickly addressed. A parallel can be made with the performance of sites IPA benchmarks. Although many of our clients have engaged in regular benchmarkings of their site-based project performance within defined intervals, others have adopted a more haphazard approach to site health and performance measurement. In 2015, IPA found that sites went an average of 4.5 years between baseline benchmarkings and their follow up appointment. That year, IPA observed an alarming decline in performance—in fact, the year marked an all-time low for performance outcomes of IPA-benchmarked sites. The use of key Best Practices for site-based project performance declined as well as the project performance outcomes. Site-based projects were more expensive, took longer, and were less predictable. Alarmingly, just 17 percent of sites benchmarked by IPA that year delivered project portfolios in which more than 40 percent of their site-based capital projects could be considered successful. Site Benchmarking: Years between site benchmarking are correlated with decreased project success. In a follow-on study conducted the next year, IPA first investigated the relationship between less frequent measurements of site health through regular benchmarking. Site health questions were asked: Did sites improve performance, maintain already good performance, or did their performance worsen? On average, sites that improved or maintained their health were benchmarked every 3.2 years. 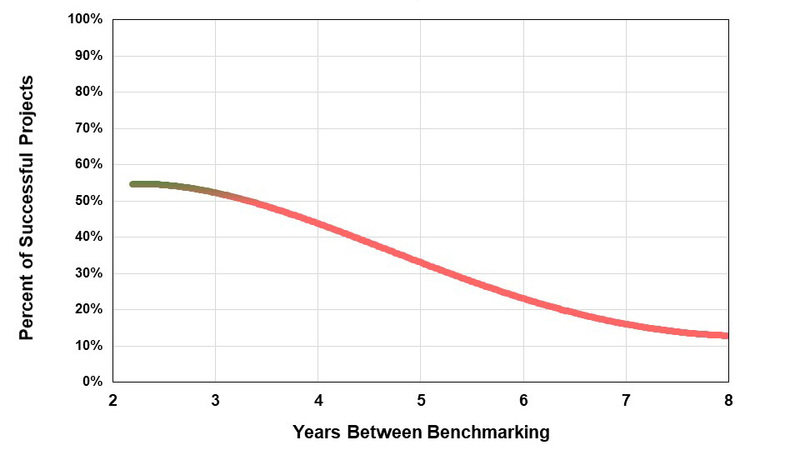 When we looked at sites whose performance suggested declines in their overall health, we found that the average duration between benchmarkings was 4.5 years. For those sites with degraded performance, the projects were, on average, 16 percent less cost effective (or more expensive) than at the previous benchmarking, with all but one of the unhealthy sites showing a degradation in cost effectiveness of 10 percent or more. Projects at sites with worsened performance were also less cost predictable, with significant variability in outcomes. Conversely, sites that took their health seriously by embarking in more frequent measurement were more likely to have improved or maintained their performance. Like patients adhering to a regiment of frequent exercise and a proper diet, these sites that are regularly benchmarking tend to focus on improvement efforts in key areas, most commonly improving teams and Front-End Loading practices and enhancing project controls. The result was more predictable cost and schedule outcomes as well as improvements in cost competitiveness. There were also additional benefits: 15 percent more competitive cost targets; a reduction in the frequency of late changes; and, most significantly, increases in the percent of successful projects delivered across the portfolio. IPA has continued to investigate the relationship between the frequency of health status checks through benchmarking and performance outcomes. Frequent measurement continues to correlate with improved or maintained performance. IPA has been encouraged by how many sites have embraced more frequent measurement. In fact, some of IPA’s top performing sites and companies have increased the frequency of their site health checks. Benchmarking in and of itself is not a panacea. But site personnel are empowered with knowledge gained from more frequent benchmarking, enabling them to focus their energies on site improvement efforts. Regular measurement works because it allows observation and monitoring of capital expenditure. The root causes of results that fall outside expected ranges (both good and bad) can be investigated and traced back to their origins. Further, regular measurement allows incremental changes to be identified and appropriate adjustments to practices made. However, perhaps most importantly, regular measurement forces accountability for site health. For more information, visit IPA’s Site & Sustaining Capital services page.